A food trip around Manila was my first, all out adventure after my foot injury. I almost didn't make the DIY Walking Tour since both my feet hurt days before. I could barely walk. But I really wanted to join so I got myself some gel insoles and a pair of comfy socks that same week. I just told myself that I would brave the streets of Manila, and just go with the pain. I guess, that's what travelers go through when they really want to journey off real bad. I got on one of the earliest trips via LRT from Quezon City to Carriedo (our meet-up place). It was a fast trip, and I was able to make it on time. Surprisingly though, I was the last one to arrive. But soon after arriving, Jherson started introducing me to everyone in the group. 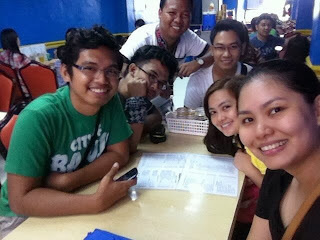 I finally met Jherson, Gelai, Nil (Gelai's Fiancé), Jaime and Mina in person. I've heard of Siopao being fried at some point, but have never tasted an actual one. So when Jherson lead us to this small food shop, I knew that I was finally going to taste what most foodie's have been raving about. And I was not disappointed. I loved how hot and packed the meat inside the steamed bun was. There were several metal basins where the stuffed buns were being toasted. We got to peek into the actual frying process. But we were able to conclude that the bottom part of the buns were the only ones being "fried". The rest of the Siopao just looked usual, but still tasted very savory. It had so much flavor, and the softness of the dough was just right. Since Jherson and I were talking so much, I already failed to notice all of the streets that we passed by. I just went along. But after a few minutes, we arrived at our second stop: Estero Fast Food. The open eatery was beside a bridge and a welcome arc. The only thing that they ordered was a platter of fried frog legs. Of course, I didn't want to be the only person who didn't try it, so I grabbed a piece just for the heck of it. And to my surprise, it tasted just like chicken. The only excruciating part about eating it was that it had a lot of bones. I didn't know frog legs could have so much, given their lanky stature. We wanted a photo with the Binondo Church as our backdrop (also known as Minor Basilica of Saint Lorenzo Ruiz or Our Lady of the Most Holy Rosary Parish), so we crossed towards the plaza, which was situated in the middle of the street. It had several monuments, a few sitting areas and a nice walkway. We captured a few snapshots here, and went on our way to our next food destination. This was just a quick stop, as the rest of the group wanted to check out the mall and the sunday food market. Gelai was able to sample some flavored and chilled Singaporean Taho. It was actually very tasty, and it had just the right amount of sweetness. The two-floor eatery was already packed at 11 in the morning. Then again, I wasn't surprised since it was a Sunday. Luckily, we still got the last few tables upstairs. Anyhow, they started ordering some dumplings and a bowl of Mami, from which we all dug in. We made sure not to power eat so that we'd have enough space to sample other cuisines. The Chinese viands that they ordered were a tasty treat. Heck, who doesn't love Chinese food, right? Anyhow, I especially loved the veggie and shrimp-filled dumplings (didn't eat the shrimp of course), as it resembled my favorite Kuchay. It just had a different name to it, which I can't seem to recall. 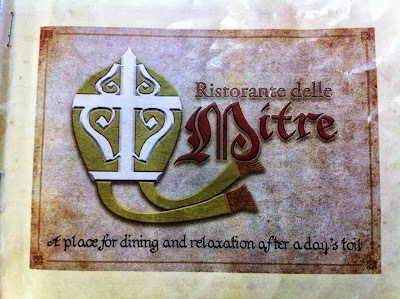 Ristorante delle Mitre was our last stop for our DIY Walking Food Tour. This is where we had lunch and met up with RJ. We wanted to try the food from this particular restaurant (where I ordered a Beef Salpicao rice meal for lunch), which was just in front of the San Agustin Church. Risotrante delle Mitre means "Restaurant of the Miter". A Miter is a bishop's official headdress (you'll see this as part of the restaurant's logo). 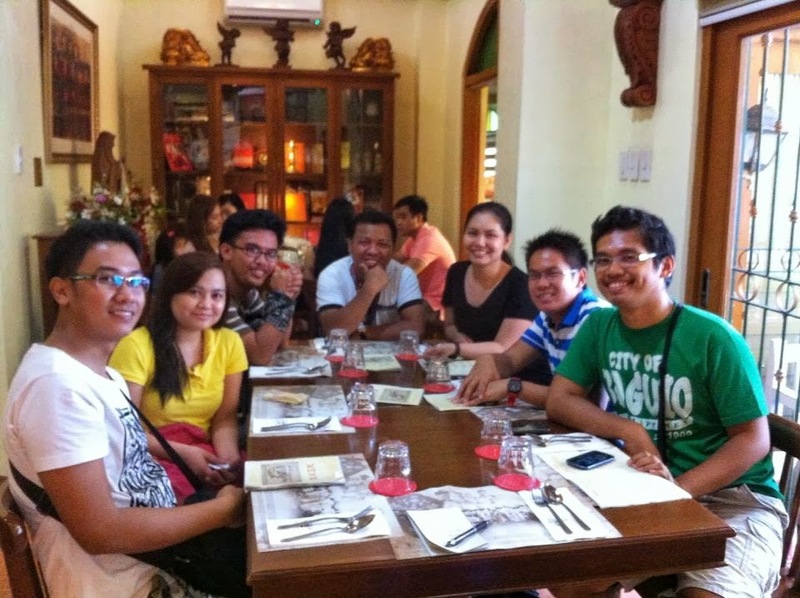 Furthermore, the cozy restaurant is said to be the only 'Catholic-inspired eatery in the Philippines'. A TWO THUMBS UP FOODIE ADVENTURE! Our day wasn't done yet since the rest of our afternoon was spent with Carlos Celdran. :) Yes, we joined the FREE #VivaManila Walking Tour, along with 200 participants (more or less). 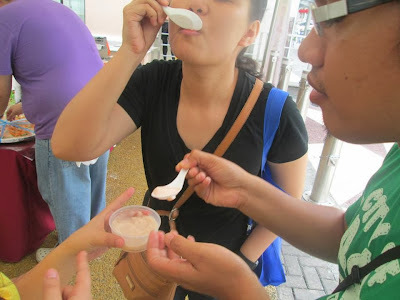 Anyhow, our DIY Walking Food Tour was tiring yet a lot of fun. I really enjoyed exploring Manila, especially Chinatown for all its food glory. Of course, I enjoyed the tour even more since I was in the company of such good people. I would've regretted not going that Sunday, if I didn't woMAN UP! But on a serious note, that morning food trip was a totally enriching experience. Despite my aching feet and the constant drizzle that day, I still had a blast. UP NEXT is OUR #VivaManila Walking Tour! The only place Ive tried here is the Waiying! Awww! 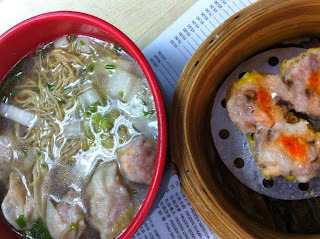 Yummy Siomai and dumplings galore..
Hehehe! 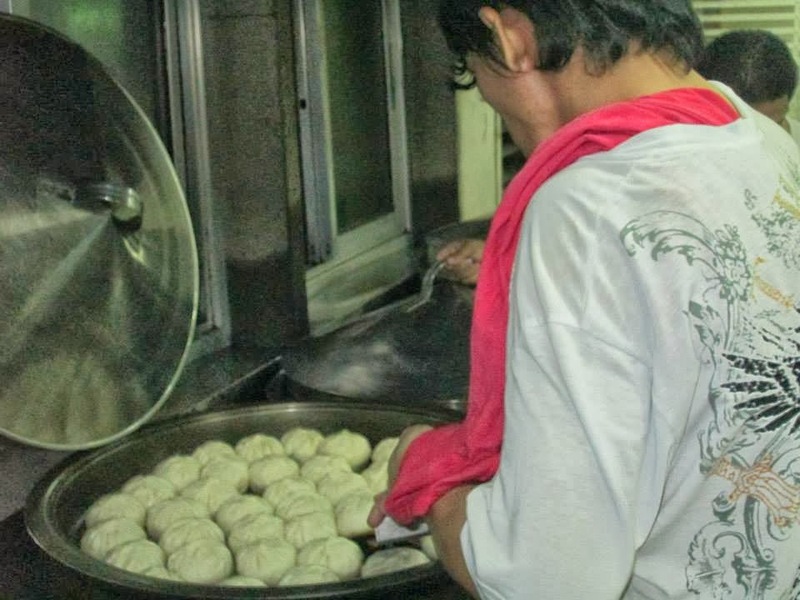 Nabusog kaba kagad sa Baguio Food Tour niyo last year?